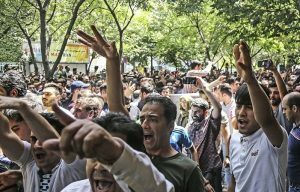 Iran is in the midst of a popular uprising, and events are developing rapidly. The uprising began in December of last year when the people of Iran took to the streets to protest the regime and its repressive policies. Many of the initial demonstrations were staged to protest economic issues, but the protests quickly shifted focus to the corruption of the regime, and people began to call for regime change. Within days, the uprising had spread to over 140 cities across every province in Iran. Cries for regime change were heard across Iran. The regime was only able to temporarily suppress the uprising, though they used every weapon available to prevent the people from expressing their discontent. They sent the Revolutionary Guards and their surrogates to violently suppress protesters, they arrested scores of protesters, and Khamenei publicly blamed the MEK for the uprising, inadvertently legitimizing the MEK and the Iranian Resistance Movement. The uprising, needless to say, has persisted in the form of daily protests and strikes throughout the country. Over the weekend the uprising flared up again as the rial took another nosedive days before the U.S. sanctions are set to resume. 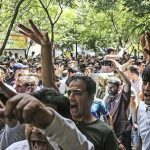 Thousands took to the streets in cities across Iran protesting for change. People chanted, “Death to the dictator!” At least one protester was killed by suppressive forces. The gap between the rich and poor in Iran continues to widen, and the poor are forced to watch as their corrupt leaders plunder Iran’s wealth. The people have no voice to speak up about their concerns because any peaceful protest is met with violent suppression by government forces intended to silence them. The people are done being silenced. They are willing to risk violence, arrest, torture, imprisonment, and even execution at the hands of the regime for the opportunity to protest for a better future. The resistance is growing because the people know that they cannot stay on the path that has been laid out before them. The life they live under the Iranian regime will always be the same. They will never have the freedom they yearn for, they will never be given basic human rights, and they will always live in a society where inequality is the norm. Iranian regime’s corrupt leadership is rotting from the inside. The factions within the regime have been fighting amongst each other for months, and they have been unable to hide their divisions from the outside world. It is clear that the regime’s leadership has no coherent vision for the country. The people have been in the streets for the past week participating in anti-government protests. Many of these protests have turned violent. Over the weekend, there were reports of police cars and tires being burned in the streets. People from all walks of life are being affected by the economic crisis in Iran. The poor and working classes become poorer, but the crisis has spread to the middle class as well. The middle classes are disappearing as costs rise and people’s savings are gradually diminished. The regime has largely ignored the needs of the people and the major problems that urgently require its attention. It refuses to leave Syria or stop supporting the proxy groups around the region that it funds. The regime is close to its downfall. It cannot continue to maintain its grip on power for much longer. The only thing needed for regime change is the support of the international community, particularly the United States. Could this be the beginning of a revolution?